This park, located between Barry Street and Lyman Street north east of the Erie Canal, includes (2) designated pickleball courts that were officially opened on August 5, 2014, and the only basketball court in the Village's nine parks. The Barry Street Park is 1.5 acres in size and has plenty of open space for activities for all ages, including recreational football games. Young children have benefited from the efforts of the Brockport Integrated Service and Community Organization (BISCO) who added playground equipment in 1999. A new parking lot, an in-park sidewalk, and a new boundary fence was erected in 2007. In 2008, the additions of toddler swings, park benches, a pavilion (donated by PetSmart) with an American Disabilities Act (ADA) compliant accessible picnic table w/attached benches, and a climbing tunnel, as well as better lighting, were made. New trees were planted by the Village of Brockport Tree Board in the park and on Barry Street on Arbor Day 2012. Corbett Park was named in 1975 to honor the families of John and Patrick Corbett who once owned a substantial amount of land around Smith Street. The Corbetts would cut ice in the winter to be stored in their ice house next to the pond. After refrigeration it became a favorite place to ice skate. 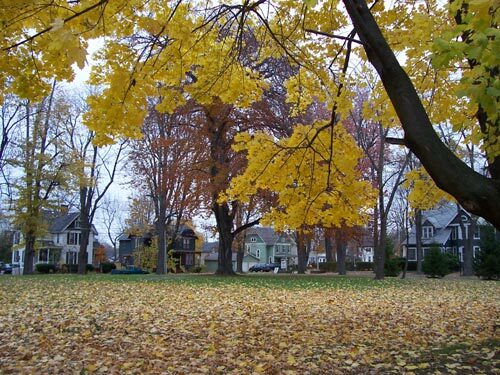 This 9.7 acre park is located at the southwest corner of Smith Street and Clark Street and is the Village of Brockport's largest park. Through the efforts of BISCO there is a large play area. Corbett Park contains an open pavilion (thanks to Eagle Scout Kevin Rombaut) complete with eight picnic tables (thanks to Eagle Scout David Moon). In addition, several picnic tables and grills are located throughout the treed area of the park. Corbett Park has three tennis courts, an area for basketball, and a large open space that leads to the Erie Canal. A paved walking path winds through the park and past the pond. Playground equipment in this park, geared mainly for the younger members of our community, includes swings, a slide, 2 balance beams, a spring seesaw, and a turbo tower climber. There are also two park benches and a bike rack. The playground t at 211 Evergreen Road is on three tenths on an acre and, thanks to Eagle Scout Jay Thomas, includes a paved path and wooden steps with hand rails that leads up to the beautiful Erie Canal. In 1845 William Seymour and Dayton Morgan began quantity production of Cyrus McCormick's Harvester Reaper. Now the location of the oldest reaper factory in the world is home to beautiful Harvester Park. The park got its name in February 1970, when Harold Richards won the naming contest and received a $25 bond. Nestled on the banks of the Erie Canal this park is located on the corner of Water Street and Park Avenue. The two story Welcome Center located in the park features two handicapped accessible bathrooms with showers, a coin operated laundry, Harbormaster Suite, and a common room with cable television with DVD and wireless internet. Canal travelers can enjoy fresh coffee prepared by one of our eighty-five volunteers. Eleven pedestals can accommodate a total of twenty one tie-ups with dockside water and electric only steps from picnic tables and grills. A low level landing for canoes and kayaks makes a welcome site for those who choose to paddle to Brockport. The Center is open seven days a week from 10:00 a.m. to 8:00 p.m. during the regular boating season. The Walk/! Bike! Brockport Committee raised the money to bring the Bill Stewart metal sculpture, "Howdeee" to the waterfront. Our Harvester Park/Welcome Center project won designation as a 2005 "Project of the Year" by the Awards Committee for the American Public Works Association. Harvester Park is a short walk from downtown, our "Victorian Village on the Erie Canal." This playground, located at 47 Havenwood Drive, is two tenths of an acre and is geared mainly for the younger members of our community. Playground equipment includes swings, a slide, 2 balance beams, s spring rider, an e-z digger, a rockblock climbing tunnel, and a turbo tower climber. There are four park benches in the Havenwood Park. For nearly fifty years, this park was the location of the Village of Brockport Grammar School. The school was demolished during the 1950s, and the site was then used as a playground. Community members came together in 2000 to upgrade this popular playground in the center of Brockport. The new playground equipment they installed complies with the Americans with Disabilities Act (ADA) Accessibility Guidelines for Play Areas so that all our kids can grow in a fun, engaging, challenging, all-inclusive play environment. Located at the intersection of Utica and Holley Streets, this park/playground covers nine tenths of an acre. Handicap accessible picnic tables, donated by Petsmart, can be found under the pavilion. A glider swing was recently installed so that parents and friends could sit comfortably and watch their children at play in this kid-friendly playground. Formerly called "The Utica Street Park," on August 9, 2011, Mary Ann Thorpe's resolution to rename "The Utica Street Park" to "The Monika Andrews Children's Park" was accepted. The re-naming was in recognition of Monika Andrews for her lifelong dedication to helping others as well as to recognize her successful mission in establishing a playground for all the youth of our community. Monika's Playground is the first handicap-accessible playground in Monroe County. Brockway's Port was our village's original name—in honor of Hiel Brockway who together with James Seymour founded our fine Village. When Mr. Brockway laid out the village he made no provisions for a park so this triangular piece of land on Park Avenue, between High Street and Spring Street, was set aside for this purpose. This previously unnamed park was dedicated in June 2001 and is now known as Remembrance Park in remembrance of all the civilians who lost their lives due to the terrorist attacks in New York City on September 11, 2001. The Royalty Flowering Crabtree in the southwest corner was donated by St. Luke's Episcopal Church in celebration of thanksgiving for shared community partnerships in ministry. In 2006 the Art & Aesthetics Committee of the Walk! Bike! Brockport Action Group presented the Village with the sculpture "les Racines et Les Raisons" (French for "The Roots and the Reasons") that was created by SUNY Brockport Professor and artist, Jennifer Hecker. The Victorian bench, donated to Remembrance Park by neighbors and friends, offers an ideal spot for rest and reflection. Although this is the smallest of our village parks (73' x 100'), its location at 96 Main Street is ideal for community events like "Cool Kids in the Park," a program designed to feature performances and interactive presentations geared toward the younger audience. What a perfect spot for the ceremonial lighting of our community Christmas tree at the end of the annual Holiday Parade of Lights! Mrs. Patricia Sagawa presented land for this park to the village in memory of her husband, the late Dr. Hidetaka Sagawa, who died in 1995. Dr. Sagawa was a former president of Lakeside Memorial Hospital medical staff and chief of surgery. Community groups have helped to keep this garden beautifully maintained making it a true gem in the center of our historic village. For the past 125 years village residents have admired the majestic height and form of the beautiful beech tree that sits in the southeastern quadrant of our Village. Located on a corner of approximately one acre of land at 52 South Avenue, it is surrounded by open space that was once the site of the Dailey homestead. The land was sold to the Village in 1997 and was designated as a park by the Village of Brockport in the Fall of 2006. Individuals, families and groups enjoy using the spacious green unencumbered area for games and picnics.